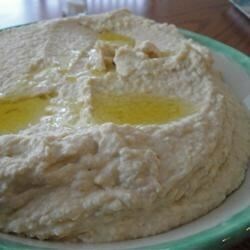 "This version of the delicious, creamy Middle Eastern dip uses non-fat yogurt and is delicious with crackers, raw vegetables or toasted pita slices." In a blender or food processor, blend garbanzo beans until smooth. Mix in garlic, salt, lemon juice and yogurt. Blend to desired consistency. I did this recipe exactly and it came out more like a hummus shake. Very watery. I HELD BACK ON THE JUICE FROM THE BEANS &SEASONED WITH THE LEMON JUICE TO TASTE. I ALSO ADDED SOME TAHINI SIMPLY BECAUSE I LOVE IT. THE RECIPE CAME OUT GREAT AND NOT RUNNY.